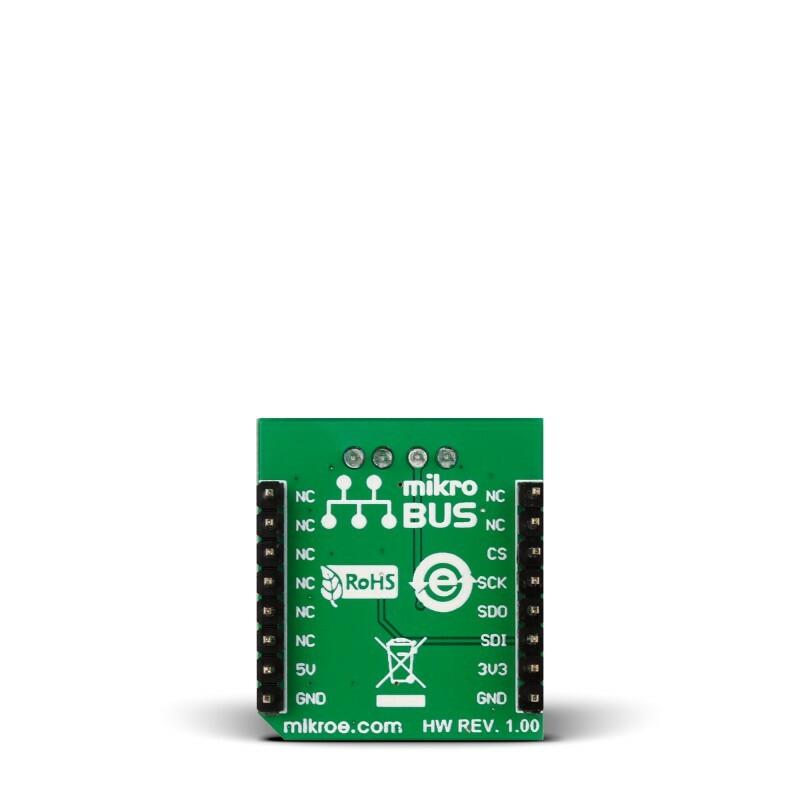 DIGI POT 2 click is a mikroBUS™ add-on board with a single channel digital potentiometer TPL0501 with 256 wiper positions. 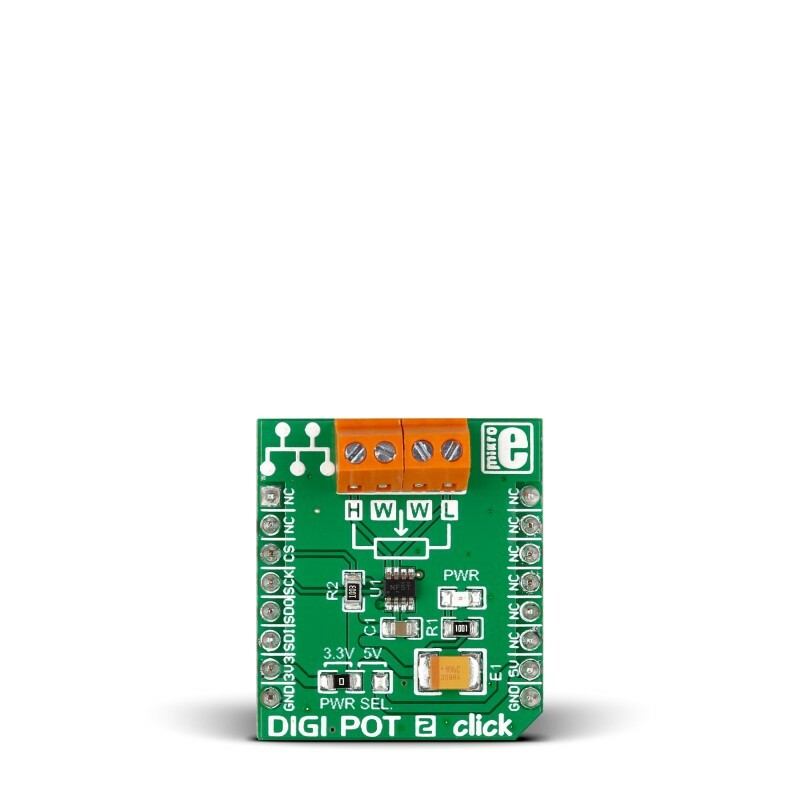 DIGI POT 2 click is a mikroBUS™ add-on board with a single channel digital potentiometer TPL0501 with 256 wiper positions. The IC has 100 kilo Ohms end-to-end resistance, with ±20% tolerance. 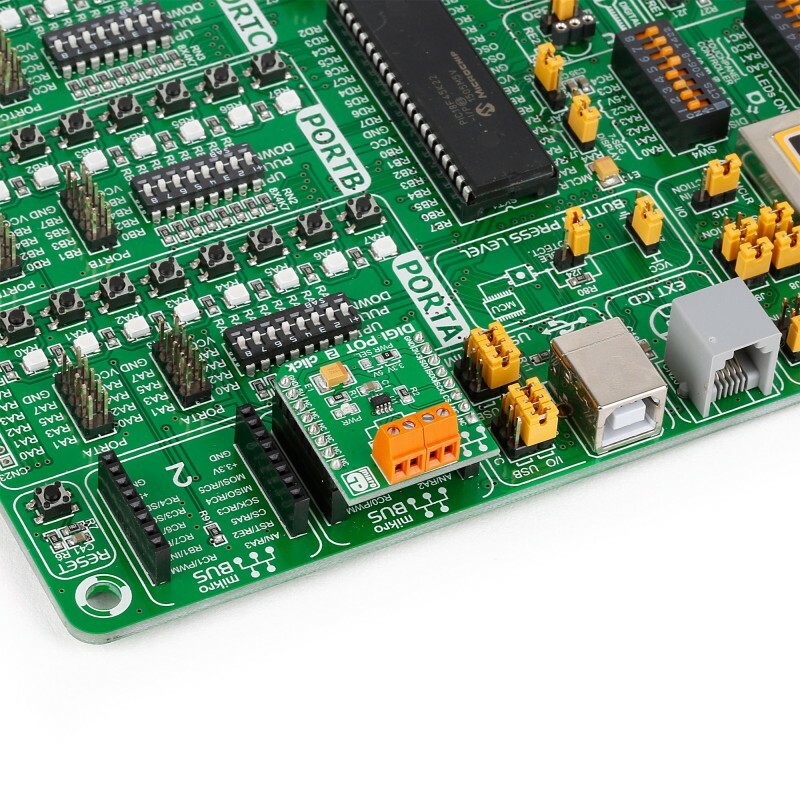 The board features two pairs of screw terminals for interfacing with the IC DIGI POT 2 click communicates with the target MCU through the mikroBUS™ SPI pins (MISO, MOSI, SCK, CS). 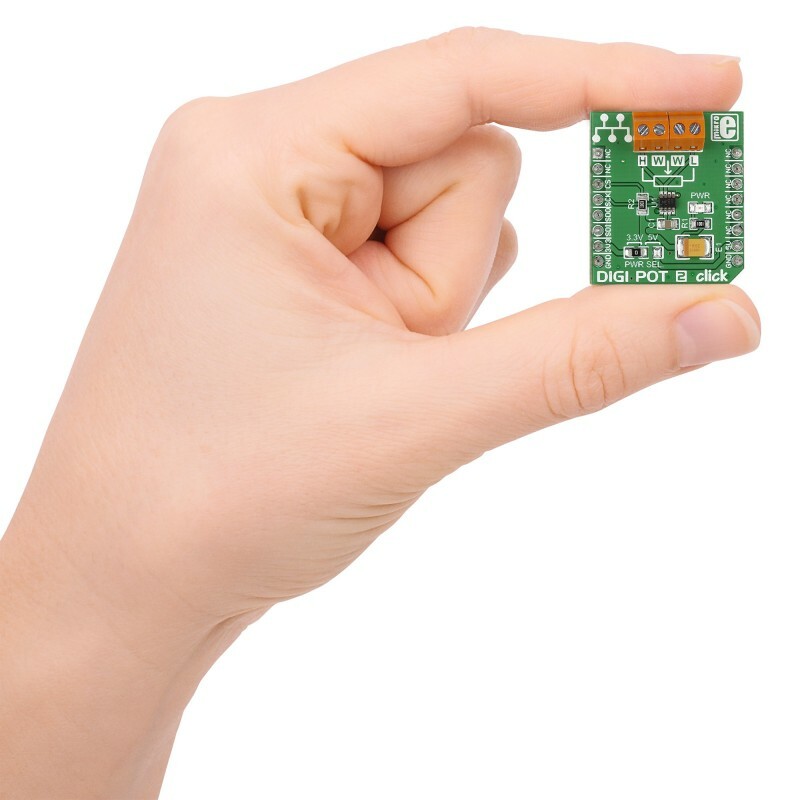 The board is designed to use either a 3.3 or a 5V power supply. Digital potentiometers are mixed signal devices intended as replacements for mechanical potentiometers. They can be used for consumer electronics, adjustable power supplies, precision calibration and sensor trimming. The device has three terminals: High termianl, low terminal and a wiper terminal which is in-between. The wiper terminal is adjusted through SPI, moving through the specified 256 steps. More details on each one can be found in the TPL0501 data sheet. Digital potentiomenters can have any kind of interface. Not just knobs like mechanical potentiometers, but also buttons, capacitive inputs etc). Another advantage of digital potentiometers is that you can create any desirable sweep profile (linear, digital or any other function). The operating temperature of TPL0501 is between -40ºC to 125ºC. ESD performance is tested per JESD 22 requirements (human body model). 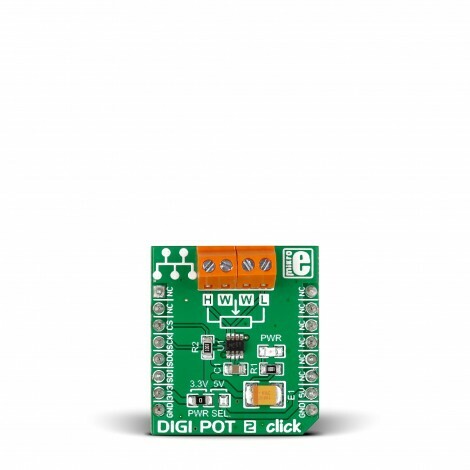 DIGI POT 2 click can be used both with a 3.3V or a 5V power supply, as determined by the position of the onboard jumper (soldered to 3.3V position by default).